No purchase or payment of any kind is necessary to enter or to win this promotion and will not increase the chances of winning. Void where prohibited by Law. Who is Eligible: Contest is open to all legal residents of the fifty United States and the District of Columbia who have internet access. Must be 21 years or older to enter. Individuals employed by the Reno-Sparks Convention and Visitors Authority (RSCVA), its affiliated divisions, contest partners, the promotional or marketing agencies of the RSCVA, or immediate family members of aforementioned may not enter. Immediate family members are defined as parent, spouse, sibling, children or anyone sharing the same address as an employee. How to Enter: Post a picture of yourself and your dog to your own public Instagram account on March 23, 2019, including #NationalPuppyDay, #DogGoneReno, @RenoTahoe and @RenRenoDowntown in the caption. 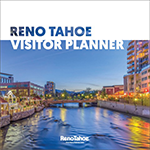 Go to VisitRenoTahoe.com/contests for additional information. Entries must be received within the contest entry period in order to be eligible. Attempts made by the same individual to enter the contest in the name of another individual will be disqualified. Online entries may only be submitted by the authorized account holder of the social media account. Any person who attempts or otherwise encourages, directly or indirectly, the entry of false contact information or uses any device or artifice to enter or encourage, directly or indirectly, multiple or false entries will be disqualified. In the event of a dispute over the identity of an entrant, validity of entry will be determined by the sole discretion of the RSCVA. Winner Selection: Subject to further verification and compliance with these Official Rules, Terms and Conditions, the prize will be awarded to a winner(s) randomly selected by the RSCVA among all eligible entries on March 28, 2019. The RSCVA shall be the sole judge of which entries are eligible entries and its decision and drawing will be final. The winner(s) will be notified via comment on the entry photo and direct message on Instagram. Should winning entrant not respond to the notification within the specified response deadline, that winner shall forfeit their eligibility and prize, and the RSCVA, in its sole discretion, may select an alternate winner. The RSCVA is not responsible for misdirected or corrupted e-mail addresses that prohibit a person from entering the contest or that prevent the RSCVA from identifying or contacting the winner(s). Odds of winning depend upon the number of eligible entries received and the number of prizes allocated to the contest. Prize Redemption: Winner will receive instructions pertaining to redemption of prize, either by mail or email. Winner may be required to submit original prize documents or credentials when redeeming prize components at contest partner locations. A valid government-issued photo ID may be required in order to claim or redeem the prize. Blackout dates may apply, as well as prize expiration date. Prize sponsors may impose additional restrictions regarding redemption, which can be found on the prize letter and/or credentials. Prize is awarded “as is” with no warranty or guarantee by RSCVA and its contest partners. Any expense not specifically stated as being included in the prize is the sole responsibility of the winner. Winner is responsible for all incidental expenses and costs that they may incur to receive, own, use and enjoy a prize. The winner may not transfer or substitute the prize and there is no cash value for unused prize components. Federal, state and local taxes, charges and incidental costs, if any, are the sole responsibility of the prize winner. Prize sponsors may impose additional restrictions regarding redemption, which can be found on the prize letter and/or credentials. Prize is awarded “as is” with no warranty or guarantee by RSCVA and its contest partners. Release: By entering, entrants agree to release, waive and hold harmless the RSCVA, its affiliated divisions, promotional or marketing agencies and contest partners from any and all claims, losses, damages and liability arising from injuries (including death), damages, costs or expenses of any kind (including without limitation attorneys’ fees) incurred as a result of the entrant’s participation in the contest and/or their acceptance, use or misuse of any prize or element thereof. Entrants acknowledge compliance with the Official Rules, Terms and Conditions, including all eligibility requirements. Entrant agrees to be bound by the decisions of the judges and warrants that she/he is eligible to participate in this contest and is at least 21 years of age by the date of entry. All entries become the property of the RSCVA. Neither the RSCVA, its affiliated divisions, contest partners, the RSCVA’s promotional or marketing agencies, or telephone network or service providers are responsible for incorrect or inaccurate transcription of entry information, or for any human error, technical malfunctions, lost/delayed data transmission, omission, interruption, deletion, defect, line failures of any telephone network, computer equipment, software, inability to access any website or online service or any other error or malfunction or late, lost illegible or misdirected entries. Entry of drawing for any prize offered by RSCVA through any of its websites requires the acceptance of a cookie. If an entrant does not allow cookies to be accepted via appropriate browser settings, they will not be allowed to enter the drawing. The RSCVA reserves the right to substitute the prize with a similar prize, and in its sole discretion, to modify, suspend or terminate the contest (or any portion thereof) for any reason, including without limitation, equipment failure or malfunction, security or proper play of contest, acts of God, natural causes, labor disputes, or fire, flood or other casualties. Winner agrees that their image and/or likeness and name and email and city name may be used in the promotion of future drawings and/or RSCVA contests and promotions, with no further compensation being due to said winner. Disputes: Entrant agrees to release the RSCVA, its affiliated divisions, their directors, employees, officers, agents, promotional agencies or contest partners, from any and all liability, loss or damages arising from or in connection with the awarding, receipt, and/or use or misuse of the prize or participation in any prize-related activities, and claims based on publicity rights, defamation or invasion of privacy. Entrant agrees that all issues and questions concerning these Official Rules, Terms and Conditions, shall be governed exclusively by Nevada law without giving effect to any principles of conflict of law of any jurisdiction. Entrants agree that Nevada courts shall have exclusive jurisdiction over any dispute or litigation arising from or relating to this drawing. Entrant agrees that any and all disputes, claims and causes of action at law or in equity arising out of, or relating to, this contest or any prize awarded shall be resolved individually, without resort to any form of class action and filed only in the State or Federal courts situated in Washoe County, NV. Entrant hereby consents and submits to the personal jurisdiction of such courts for the purposes of litigating any such disputes, claims or causes of action. Any and all claims, judgments and awards shall be limited to actual out-of-pocket costs incurred, but in no event attorneys’ fees. Under no circumstances will any entrant be permitted to obtain awards for, and hereby waives all rights to claim, punitive, incidental, special, consequential damages and any other damages, other than for actual out-of-pocket expenses, and any and all rights to have damages multiplied or otherwise increased. Request for Winner(s) Name: Requests must be received in writing (via email or mail) within five days of the close of the contest. Requests must include the specific contest name and the prize offering. As a security precaution and privacy measure, information provided will only include the winner(s) first name and their abbreviated email address. For questions or concerns about this website, contact [email protected].